In an era when, for most of us, an Internet connection is typically within a hand's reach to a smartphone, laptop or tablet, it can be hard to believe that 60 percent of the world's population lacks connectivity. The ubiquity of Internet – not just for recreation and communication, but as a requirement in most jobs – is easy to overlook. Hospitals store their records in the cloud, educators rely on online resources to teach their courses, and engineers build models using powerful Internet calculators. Thus, for the unconnected 60 percent, who are predominantly female, low-income, rural, and living in developing countries, lack of access can affect every facet of their lives—from how they communicate with family members, to how well their crops grow, to how long they will live. Our team of Development Practice students traveled to the Dominican Republic in March to explore these issues of Internet connectivity and access to information. Solutions to address the lack of Internet connectivity in developing countries have been limited, as it is typically assumed that expanding broadband (i.e., 'wired') connections is simply a process that takes time, but will occur alongside other infrastructure improvements in low-resource settings. However, in many developing countries, the political will and market forces do not exist to spur this kind of infrastructural investment. In the Dominican Republic, the major telecommunications company admitted that they have no immediate plans to expand Internet infrastructure to inaccessible, hilly rural areas; it simply doesn't make sense for them financially. In mountainous countries like Peru, where the poorest of the population live in the least accessible areas, this lack of connectivity – often of electricity as well as Internet— is likely to persist for decades. Lower-cost solutions are only now beginning to emerge, with the worldwide expansion of smartphones. As of 2016, 37 percent of people in emerging and developing countries owned smartphones, and this percentage is growing quickly as lower-cost devices become available. The ubiquity of smartphones has unlocked new potential for connectivity. For example, in Cuba, a citizenry that is largely excluded from Internet access by the government has found an ingenious work-around: a thriving offline 'intranet' that facilitates mobile-to-mobile communication and file-sharing through Bluetooth and USB drives. The Cuban case indicates that lower-tech 'offline Internet' solutions are a promising way to deliver the core functionality of the Internet to the unconnected. Offline Internet technologies leverage smartphone technology and the availability of lower-cost computers, in general, to deliver information to the unconnected. A Raspberry Pi minicomputer, with a capacity of 128GB, can be pre-loaded with content by someone with an Internet connection, then function as a router – broadcasting information wirelessly to up to 30 smartphone or laptop users in the vicinity – all for less than $100. This 'Internet-in-a-box' device has the potential to revolutionize the way unconnected people access information. While USB drives in Cuba are used to share movies, newspapers, and TV shows, members of the MPA in Development Practice program have been interested in exploring the potential of information and communication technology for development contexts (ICT4D). After conducting initial research on offline trends in Cuba in 2016, they continued the work in the Dominican Republic in March of 2017. In this study, the team of MPA-DP students, along with faculty advisor Anne Nelson and technical advisor Mariela Machado, conducted needs assessments and basic viability testing of the Internet-in-a-box device in rural and urban areas of the country. The Dominican Republic is an excellent laboratory for investigating the potential of offline Internet. It is a high-middle income country, but one where only 52 percent of the population reported accessing the Internet at least once in the last year and where cellular data subscriptions can be prohibitively expensive. Further, to investigate the development possibilities of the Internet-in-a-box device, the MPA-DP team partnered with Mt. Sinai's Global Health program and the Wikimedia Foundation, to better understand how open-source offline medical content might help healthcare providers in the Dominican Republic. 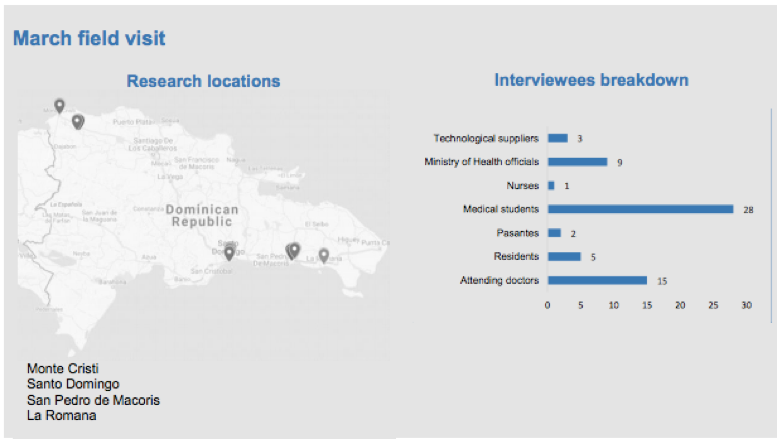 The team conducted interviews and focus groups with 63 people – primarily healthcare providers, from medical students to interns, experienced physicians and ministry of health officials. They also interviewed telecommunications professionals. The research uncovered a number of informational gaps that face healthcare providers in the country, at all levels and in all contexts. 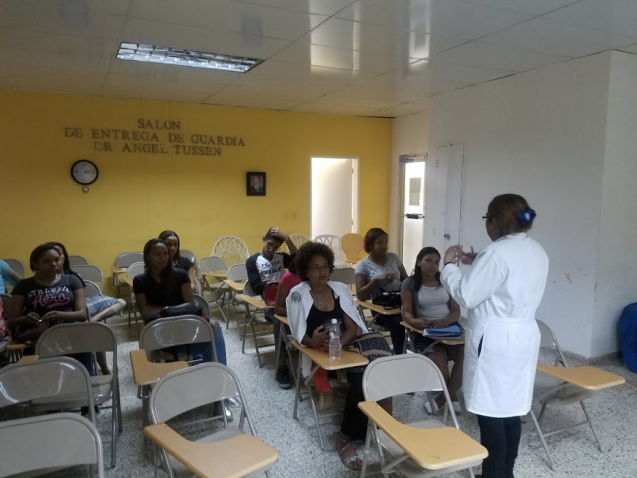 In the Dominican medical system, recently graduated doctors are sent to primary care clinics in the countryside to conduct a year of mandatory service to the country. In these contexts, these inexperienced physicians are often the only healthcare provider in the region, and staff clinics that lack most medicines, advanced equipment, and sometimes even electricity. None of these clinics had Internet connectivity, and these young physicians often could not afford a data plan to access the Internet, so relied on their medical school textbooks. As one physician interviewed said, upon beginning the service, all of a sudden, "you're the gynecologist, the pediatrician, everything!" These young doctors reported wishing they had more resources to help with differential diagnoses and dosages of medications – especially as they dealt with both adults and children. In these rural contexts, young doctors were excited about the potential of offline Internet to help them access more comprehensive resources than the textbooks they'd been able to carry with them. One doctor reported seeing a case of diphtheria—a disease she'd never been taught about in medical school – in which an open-source resource like Wikipedia's Medical Encyclopedia could be a godsend. Even in urban contexts, the research team found that experienced physicians in large city hospitals would benefit from offline Internet. Major hospitals, just like rural clinics, lack Internet connectivity, and one visited by the team in San Pedro de Macoris had a library comprised of a single bookcase filled with outdated medical textbooks. Experienced physicians reported that the Internet-in-a-box device that contained frequently-updated information about treatment protocols for more complicated presentations—such as HIV – would help specialists keep current with gold standard treatments. Another physician successfully used the device in a classroom setting, asking her medical students to connect to the device through their smartphones, and research and report on symptoms of head trauma, something that would not have been possible previously, with no connectivity. Finally, a challenge encountered in both rural and urban settings was the preponderance of monolingual Haitian patients. The Dominican Republic's 10 million population is about 10 percent Haitian immigrants – both official and undocumented – who are largely segregated from Dominican society. In the clinics and hospitals where the research was conducted, physicians reported that between 10-80 percent of their patients were Haitian (a particularly high number of Haitian patients were seen in the Monte Cristi region in the northwest, near the Haitian border). However, only one of the physicians interviewed spoke even rudimentary Creole, and the rest of the doctors relied on informal translation from patients' family members. The Internet-in-a-box device that was piloted included a Creole-Spanish dictionary, which the clinicians said would totally change the way they interacted with Haitian patients. The partnership of the Wikimedia Foundation and its team of volunteer editors and content creators opens up the possibility of creating more robust resources, including video content, to facilitate communication across these languages. This research project found that enthusiasm for the Internet-in-a-box device was universal across provider ages and working contexts. Following this support, and interest from the Ministry of Health and the Universidad Iberoamericana (the preeminent medical school in the country), the team will continue the project in summer 2017, placing devices in rural clinics and monitoring and troubleshooting their usage. The MPA-DP team believes, however, that the device could have potential far beyond the Dominican Republic and the healthcare sector. As many places around the world continue to be (and are likely to remain for some time) unconnected, the Internet-in-a-box hardware will only become cheaper and more powerful, and the only limit on its contents are what is open-source and available. Thus, the continued partnership of Wikipedia and other open-source content providers is crucial to ensure the material on the device is relevant and up-to-date. In future years, the team hopes to see the device used for other applications, from education to agriculture, and in other countries that face similar challenges to the Dominican Republic: from Cuba and its lack of broadband connectivity, to Peru and its indigenous, Quechua-speaking population. We hope that this research has laid the groundwork for further ICT4D research at SIPA, and partnerships with other organizations that bring Internet to the unconnected.